You are a beautiful woman Gina! A very warm and humble human being you are! this very very sad and unnecessary time! Well said Gina. I also live in Connecticut and this is so heartbreaking. Our state is in mourning. Everyone I talk to is just dazed. Those poor families. May God Bless them all. Thank you Gina.. we need to come together as a nation and recognize our greatness asset is our ability to embrace the differences, support those less fortunate and give from the heart. There is a void in my heart following this tragic event and definitely no Christmas spirit. Christmas is for kids and although I have kids of my own, my heart is very heavy mourning the sad loss of so many sweet angels. Words are not enough, but words fail me anyway. Much love and condolences to family and friends who lost loved ones, in my thoughts every moment of every day. I feel the same way, my 3 year old is too young to understand, and still has that innocence that I hope I can hold on to for a very long time. Some of those children lost that last week. Thank you for always being so thoughtful and caring. I listened to the President's words last night and I felt moved to make things better. Let us come together to solve this problem so no more precious beautiful children will suffer. It is a difficult problem, but we owe it to the Sandy Hook victims to take it on. As a parent, I can't comprehend what this loss must be like. I don't think Christmas will be as simple and beautiful again. My boyfriend is from Newtown and grew up with the young man that committed this travesty. We currently live nearby in Connecticut and work in New York City, but my boyfriend's entire family still resides there and we are frequently in Newtown. 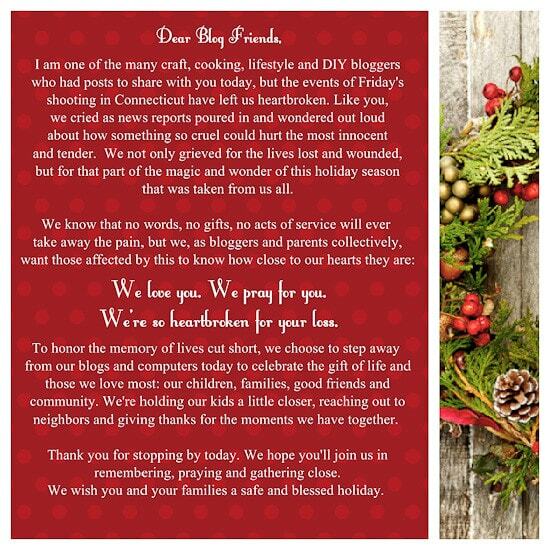 I cannot express how meaningful and fantastic it is of you to do this along with other bloggers. I just wiped away tears for what seems like the 100th time in the last 4 days, and this post brought them all back again. Thank you for being so considerate and showing such solidarity. Hopefully something good comes of this horror. It's going to be hard sending my daughter to school this morning. We are practically neighbors and it could have happened in any small town. My hope is that those lost souls that have so much anger and darkness can find a way to be healed before this happens again. Very sweet Gina… I too had a tough weekend w all this horrible news. I have twins in grade 1 and it hit hard to even imagine… I may be in Canada, but the fact remains; why?. I did not enjoy dropping them off at school this morning. I know, why is the biggest question we all have. Thank you for this! Everyday is a gift, not to be taken lightly! We never know what our day may lead to or how we may lead someone! I am praying for all of those who have lost a part of their lives! God Bless and know He is still here! We don't always understand why things happen but this I know….I know Who holds my future! Thank you. The entire country has been heartbroken by this tragedy. Out here on the West Coast, we share the sorrow along with those of you who are physically much closer to the event. Such is the nature of the world since technology has brought us all together on a daily basis, and made friends of people who will never meet in person. Take this time to hold your loved ones closer and begin to heal, and we will welcome hearing from you again when you are ready. Thank you Gina.My thoughts and prayers go out to all those affected by this terrible act. May God's grace comfort them in the days and months ahead. A Canadian neighbour. Beautifully said. I'm heartbroken for the parents. How will they ever recover? That was so beautiful. I weep for everyone affected by this tragedy. I'm so deeply saddened by this, for the children, teachers and their families. Thank you for this. I haven't been able to stop thinking about this tragedy since it happened on Friday. My thoughts and prayers are with the families of Sandy Hook. Beautifully said Gina and so very heartfelt. We were all saddened by the news and I just can't believe that something like this could happen only 35 mins away from home. (Too close to home) I don't think we will ever understand why and how soeone could do something so senseless. My thoughts and prayers are with those all who have been affected by this horrific, unimaginalble, senesless act. We all really have to stop and remember what is most important to us all our family and friends. I hope you have a good day with your children. I know I will be snuggling my little boy more often!